A Celastina echo butterfly as we usually see them. After a few false starts it feels like spring is finally underway. Days ago, a walk in the woods with my dogs produced a tick. I've said before I do not like ticks but as a community service I try to give a heads up when I see them about. 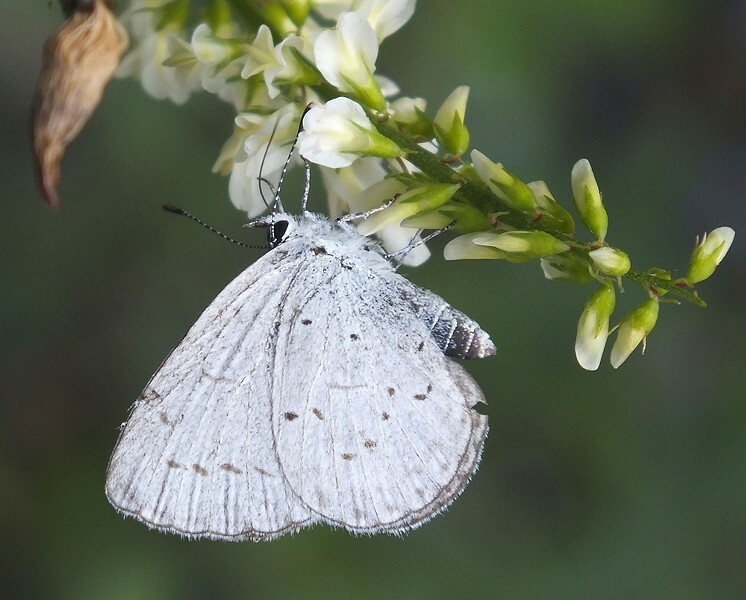 I also kicked up what I believe was an Echo Azure (Celastrina echo) butterfly. These tiny shiny blue butterflies flit along the damp places of the river bar. Unfortunately, when they land, they usually hold their wings over their back exposing the gray undersides and hiding the bright blue uppers. Only occasionally do they open them when perched and displaying to attract a mate. A couple of days later, apparently dining on trillium pollen, I noted some tiny black beetles with which I was unfamiliar. I posted my best photo and was delighted someone responded identifying it as most likely a member of the family Nitidulidae, most likely of the subfamily Meligethinae, also known as "pollen beetles." These small beetles feed on pollen and in traveling from flower to flower assist in pollination. I was able to get several photos of one of the nervous brick red butterflies which stopped to feed on willow blossoms. Although I knew it was an anglewing the complex of butterflies of that group is sometimes confusing. I was able to get some online help identifying it as well. It is a green anglewing (Polygonia faunus). Those raggedy edges on their wings are not from mishap; that is the way they grow. When their wings are closed, their gray undersides are almost invisible against tree bark. 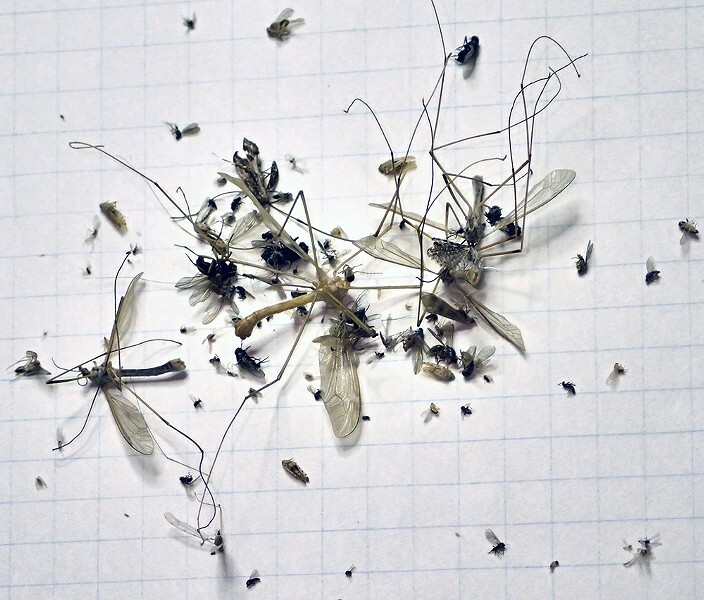 A month's worth of bugs from my kitchen light fixture. In an effort to make one of those yucky housecleaning tasks a tad more interesting, I decided to check out the dead bugs in my kitchen light fixture before feeding them to my goldfish. In the past I've found millipedes and, once upon a time, even a potato bug (Jerusalem cricket). How that got up there is anybody's guess. It is well known that many insects are phototrophic (attracted to lights) but in the case of the Jerusalem cricket, it is just the opposite. They live under rocks and logs and ordinarily shun the light. Electric lights can be deadly to insects, especially semi-enclosed ones that get warm. Small as they are, insects are continually fighting a battle to maintain the proper water content in their bodies. That is why insecticidal soaps work. They dissolve a thin layer of waxy material that helps slow the animal's water gain or loss. Some time ago, I gathered some tree moss in which to repot a vanilla vine. Shortly after bringing it into the house, I saw two crane fly larvae in the terrarium. Unfortunately, I was headed out the door and didn't get a photo. They looked like leathery gray worms about an inch long. When I got home and looked, they were gone. I guess they went toward the light at the end of their particular tunnel because I found four adult specimens dead in a nearby light fixture. They were the biggest insects in the glass bowl but they were by no means alone. There was a plethora of gnats, moths, flies, midges and even two leafhoppers. There are a great many theories as to why many species are attracted to the light. Since channeling deceased insects is beyond me, I will probably never really know. I do wonder what effect Edison's light bulbs have had on their evolution over the last 171 years. I suspect they disturb the life cycles of a great many invertebrates in ways we don't understand, even when they don't kill them directly. Dazzling a mayfly for a single night would likely remove it from the gene pool, ending its line since they only live for a day or two as adults.